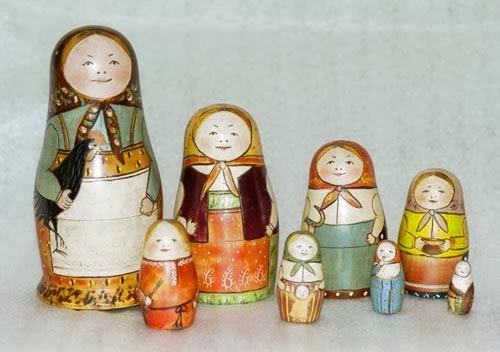 Europe is like a Russian doll. Really. But that doesn't mean Russia is part of Europe. And what about its former satellites? The Baltics are part of the European Union, so they are now firmly "in Europe" - but the future of Ukraine is not so clear. Here is my attempt to explain how Europe, the European Union and the Euro differ from each other but are all related to each other. And all are subject to change. Also Patrick Leigh Fermoy's books. Thanks Stefan. Links are not live in comments, so I have reposted your links in the Related Reading section. Thank you for trying to explain our strange european (geografically speaking)/ European (politically speaking) ways to our non-european friends. You where right the other day; many Americans seem to ignore/ overlook the deep historical scars and bonds of this continent, dismissing them as whims. To be fair, we too once in a while just can't follow the internal politics of US, or China for that matter. Posts like yours enlighten us all. By the way, your post on pound sterling, it was awesome, too. Sorry, we're (mostly) Brits. We don't need visas, even spam ones, to visit Canada. Very thick wooly jumpers, certainly, but not visas. "For example, consider a chart showing the relative economic performance of the US, the UK, the EU and Japan (I see a lot of these!). This is meaningless. The UK is part of the EU. It can’t be “compared” with it." I'm not sure that is true. If you want to know how the UK is doing compared to the EU average, then you have to compare the UK to the EU. If you wanted to, you could also compare the UK to the EU ex-UK, and I don't think you would get a very different answer. You can of course compare any EU member with the EU average. For example, the tragic situation of Italy, which used to have GDP/head 15% above the EU average, and has now fallen to parity. And by the way, I don't think that comparing how the UK is doing to how the EU is doing is just a question of proving a point. I can remember when the UK's GDP/head was down around 60% of Germany's, back around 1980, and today it's roughly equal on a nominal basis and 94% of Germany's on a PPP basis, so relative performance really does move around. Oh, and calling the Great War a "family feud" was a joke, right? At least I hope you were joking. Obviously it is possible to compare the UK with the EU average. But that is not what I am talking about. I am talking about charts that show 4 bars, one each for US, UK, EU and Japan. When I look into what these charts ACTUALLY show, they are nearly always confusing the EU with the Euro area. Typically it is a monetary policy comparison (hence the choice of countries). It was only partly a joke. Did you see the BBC's programme on the relationship between Kaiser Wilhelm, Tsar Nicholas and George V - who were, of course, all Queen Victoria's grandchildren? "When I look into what these charts ACTUALLY show, they are nearly always confusing the EU with the Euro area." That's a better point, but it isn't exactly what you originally said. On the question of the three monarchs, of course they were closely related - and God help us, are we really living in an age where we have to see a BBC program to know that? - but that had very little to do with the origins of the War. What drove the outbreak of the war was that 1916 was the last date the Schlieffen Plan had a chance to succeed. Schleiffen proposed that Germany could win a two front war with Russia and France, by taking them out in succession France first and then Russia. In other words, a two front war, one front at a time. But that depended on Russia being able to mobilize only slowly, in months, while Germany and France could mobilize in a couple of weeks. So 90% of the German army would defeat France, and then move East to defeat Russia. But then Russia started to modernize its rail network, and by 1916 would have been able to mobilize significantly faster, leading to an un-winnable simultaneous two front war for Germany. Hence the urgency to get a war started before 1916, which was the last date by which the Kaiser's Generals could guarantee a German victory. In the event, the Russians sacrificed themselves by invading East Prussia with only a partial mobilization, and suffered a terrible defeat in the process - so bad that the Russian commander, Samsonov, committed suicide - but the German staff panicked and transferred troops form the Western front to the East, which arguably saved the French. Really, the three countries could have been Republics or Islamic Califates, and the same strategic logic would have held. It is what I said, actually. You chose not to understand. Your potted history of WW1 is very interesting but takes absolutely no account of the long political buildup before it, which is what I was talking about. It's a bit like describing the last few days before the fall of Lehman while ignoring the previous two years of developing strains in the financial system. It's true, but inadequate. I'm still surprised at how much of this isn't common knowledge. A Canadian colleague - well educated and generally knowledgeable - was surprised yesterday to hear the Euro wasn't compulsory throughout the European Union. When I pointed out that the UK didn't use it, he asked "Britain's not part of the EU though, is it?" I know very few people who are current with the make-up of the EU to the West of Germany and Italy. Alex, thank you for saying this. It was the reason why I wrote the post. In practice the case of the Ukraine could be about the Eurasian Union and maybe a currency union. 2015 is the date and some people think 2017 maybe the Currency Union - not sure about that. I see what happens in the Ukraine as a certain kind of positioning before the go-live.